USDA Certified Organic Frankincense Serrata Essential Oil (Boswellia serrata) is also commonly known as Olibanum, Olibanum Tree Oil, Shallaki, and Olibanum Indicum. The oil has a medium-strength balsamic, warm, slightly spicy, sweet, and woody aroma presenting a base fragrance note. Organic Frankincense Serrata Essential Oil is part of our Skin Care and Wellness collections. Use the oil in a daily skin care routine to help improve all skin types. Organic Frankincense Serrata promotes wellness of the mind and spirit, helping to uplift the mood while bringing calm and relaxation. Draw on inner strength, enhance deep meditation, and center the mind. Frankincense Serrata Essential Oil also supports emotional healing, helping reduce feelings of loneliness, frailty, and grief, while sharpening concentration. Apply to desired targeted area as often as needed. Add 1 tsp of an unscented lotion, like our Tohi Nature’s Moisture Hand and Body Cream or Better Butter, to the palm of the hand. Add the essential oils. Blend lotion and oils in the hands, and apply to arms, legs, and body to promote deep grounding and relaxation. Perfect, not over powering. I use it in my defusser at night. I use 1-2 drops mixed with my night cream. If you've never tried this oil, it's strong smelling and takes some getting used to. My skin seems bright and fresh after using this for a month or so and was cheaper than the YL version (which I loved, but the price tag was a bit much). Great! We are happy with all our RM oils recently purchased. My favorite oil at an amazing price! 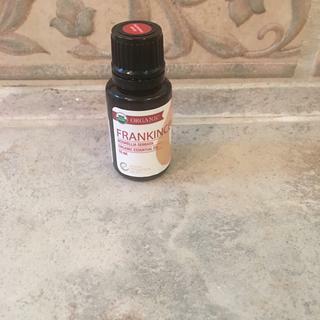 This Frankincense essential oil smells more clean and pure to me than the other brand I was using which isn't organic. I chose this one because it is organic and so far, I really like it. I was using YL but the price was hard to swallow. I love the quality.of RMO and after extensive research I have found this company very appealing and will be ordering more EO's. Nice smell I love that it is organic. Helps in my prayer time. I love the scent and the fact its organic. I use it daily and am very pleased. I added this to lavender and peppermint for a headache blend, and it was a total game changer! I also use it in an “ouchie” blend for my girls. Definitely something I will purchase again! I love this oil. Great quality!!!! I will order again. It is an amazing frankincense. Refreshing! A great addition to any collection. Good price. Order processed and shipped quickly. I appreciate the ability to sign up for alerts when product out of stock. Would like to see a larger selection of organic oils. Will be ordering again. Love it! Have been using it daily. Will be one of my on hand at all times oils. I was very pleased with this purchase. Wonderful smell; it’s not as strong as I was expecting but well worth the price and I will purchase it again. While I do love this oil I will not re-order. It went from roughly $38 to $82. That's just price gouging to me. Ill find something else. Not my favorite alone. I add to other oils though. Just not for me I guess. Beyond upset. This oil use to be $38 and now it’s over $80??????? I’ll go back to YL. How is this different from Sacred Frankincense? BEST ANSWER: They are sourced from different countries and Certified Organic or USDA Organic relates to the quality of farming practices. We hold ourselves to a higher standard, completing the extensive process for each of our essential oils to be tested for pesticides by a third party lab. All of our oils have passed pesticide testing and are the purest, most therapeutic essential oils available. We only work with quality farmers and suppliers that are experts in their craft. Everything from growing, harvesting, distillation, shipping, storage, testing, and bottling has been done with exceptionally high standards. The cost is very different. Is the sacred more potent? Is this oil suitable for ingesting? I'm not sure, I only use it topically. How do you use this oil in a skin care program? BEST ANSWER: We do not have any Skin Care programs. We recommend following our dilution rates chart if applying topically. If following the dilution rates chart the oil can be applied as needed. Thanks! -RMO Team. As a certified Aromatherapist I use it in my body lotion 1-2 drops right in my hand and 1 drop in my hand day and night anti age face lotion. I also place a drop in my setting spray right in the bottle for setting my make up. My daughter applies it directly to the skin on acne spots or any skin irritation. What type of material does RMO use to bottle their oils in? Glass. Anytime you mix oils, you should use glass. Even if you add lemon drops in your water, it should be in a glass cup. Hope this is the answer you were looking for. What is the country of origin of the frankincense? BEST ANSWER: The Organic Frankincense is sourced from India. Oman in the Medertaranian region. 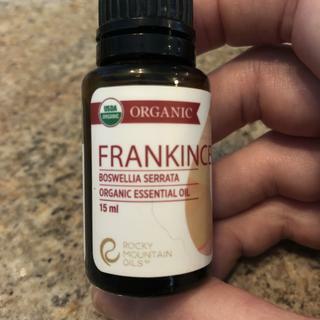 How is the Organic Frankincense Serrata different than the other Frankincense Serrata that only comes in a 5 ml bottle? Other than it being organic, is there any difference? BEST ANSWER: All of our essential oils are 100% pure, natural, therapeutic and organically grown. They are GMO-Free, GC/MS and Pesticide tested. However, until now, we have not had government USDA Certified Organic oils. If you have any further questions, please visit our Organic FAQ page on the website. Not sure, haven’t opened my yet. Can we add take this internally? BEST ANSWER: Great question! Essential oils are very potent and can be dangerous if not used correctly. All of our oils are 100% pure, natural, and authentic. They are of the quality to be taken internally. However, we cannot provide dosing suggestions or directions on how to ingest if you choose to do so. Which frankincense works best for fading scars and age spots? Sacred Frankincense may help improve the appearance of all skin types while toning and tightening the skin. The oil also may help fade the appearance of scars. Can this Frankincense be taken internally? BEST ANSWER: All of our essential oils are 100% pure, natural, therapeutic and organically grown. They are GMO-Free, GC/MS and Pesticide tested.